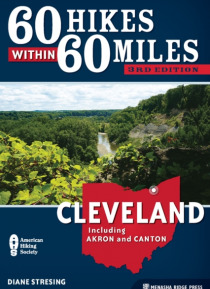 Focusing on hikes close to the metropolitan area, 60 Hikes within 60 Miles: Cleveland by Diane Stresing provides the information needed to choose the perfect day hike, along with maps, directions, driving times, and a wealth of trail details.Residents and visitors-in-the-know appreciate the many outdoor recreational opportunities this "e;All American City"e; has to offer. With new hikes an… d updated text and maps, 60 Hikes Within 60 Miles: Cleveland points hikers to the best outdoor trails and rambles within easy reach of the city.Choose from hikes such as Fork Hill Earthworks, which features Native American ceremonial grounds, and the remains of a prehistoric "e;monster"e;. A former golf course now offers scenic hiking paths at Orchard Hills, and bird-watchers will enjoy a trip to Towner's Woods or Bath Nature Preserve. Every trail offers a unique glimpse of the region, from city sidewalks to rustic footpaths.